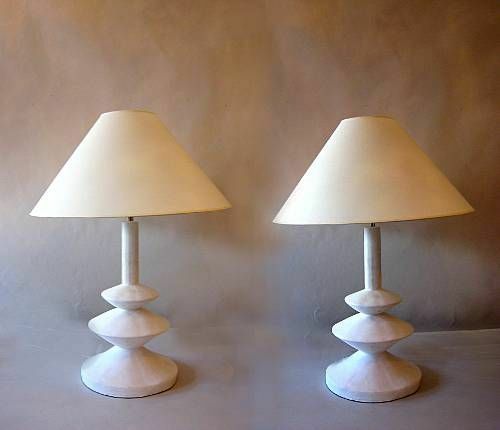 Sublime pair of French Mid-Century plaster table lamps by Jacques Grange Designed for Yves Saint Laurent Boutiques in France during the 1970s. Grange's inspiration was a model by Giacometti from the 1930s made for Jean-Michel Frank. The lamps transcend all classifications, whether it be modern, neoclassical, neo-Baroque through their exquisite form and soft ethereal plaster patina. Plaster base alone (without socket and harp) is H 18" x D 11.5. Shades are for demonstration purposes only. Several pairs available. Priced and sold by the pair. Shade dimensions shown are: Top diameter: 6" x Bottom diameter: 22" x Shade length: 13". 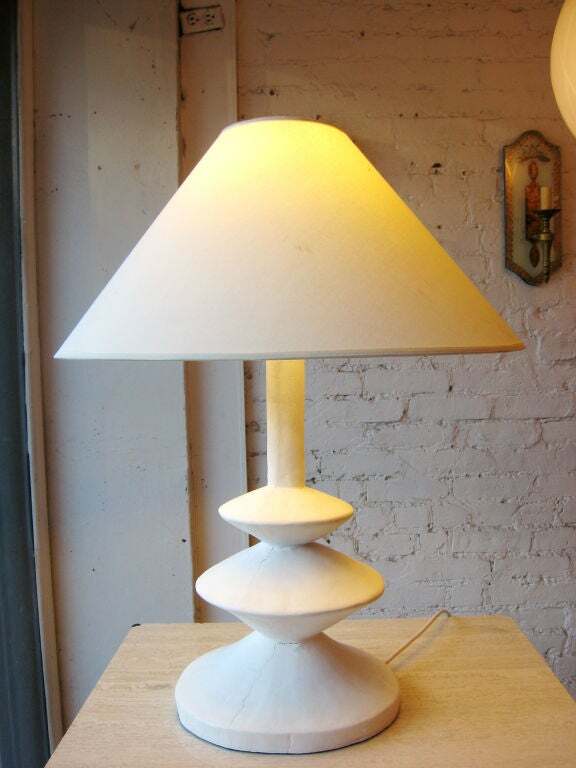 2 pairs of French midcentury neo-Baroque style plaster urn form table lamps attributed to Serge Roche. Pieces can accommodate up to 2 sockets. 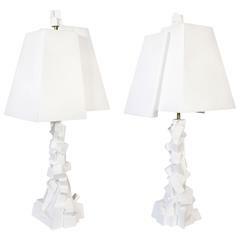 Pair of Jacques Grange for Yves St. Laurent plaster lamps. 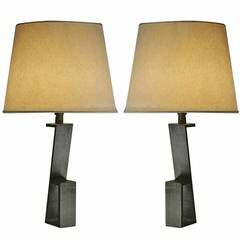 Pair of Jacques Grange sculptural lamps for Jean Michel Frank. Lamps have been repainted. Originally done by Giacometti for JM Frank in 1930s. These done by Jacques Grange for Yves St. Laurent shop in 1970s. (Height to top of a shade would be 27"). 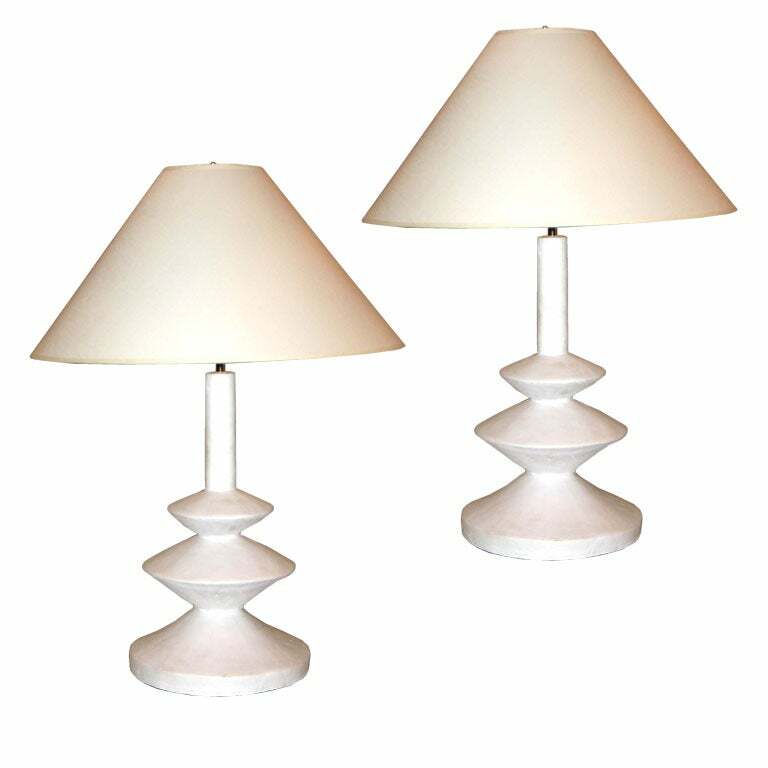 A pair of Ysolde table lamps, by Dorian Caffot de Fawes Hand cast in London, polished and waxed high quality plaster With a bespoke ivory fabric tapered shade.